Did someone go and get the chair?? Storms at the lake - always an adventure. I love fuchsia plants. Can't grow them in Texas as it is too hot. 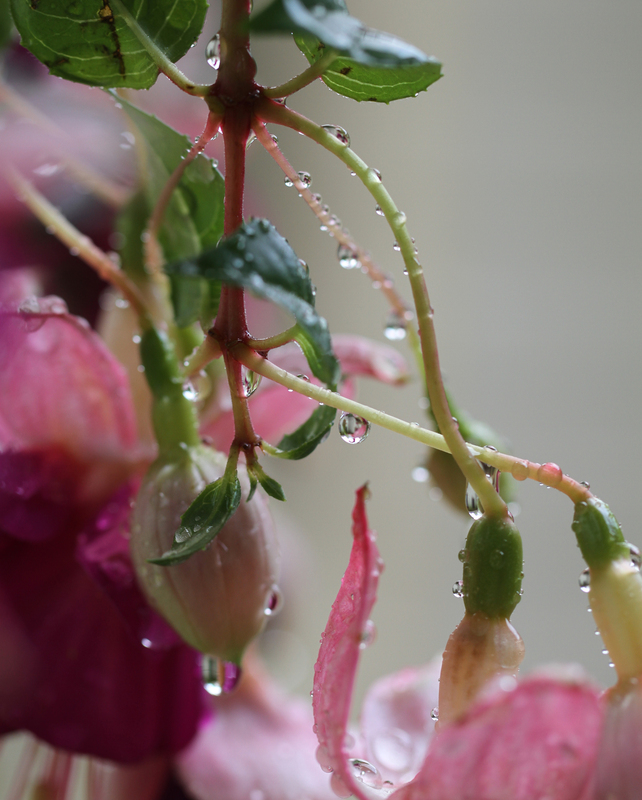 Your photos with the rain on the blossoms - beautiful. You kill me.....a windshield wiper???!!! And Dr. Suess....you made me laugh. 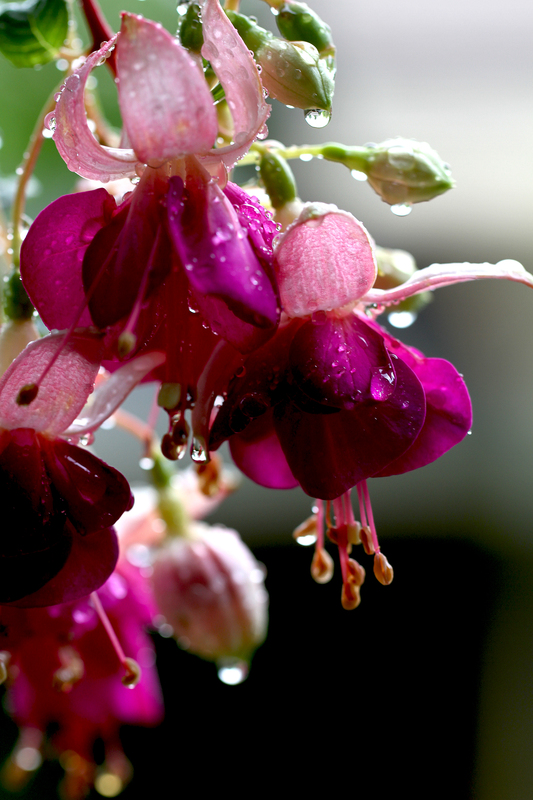 I don't know which is prettier...the fuchsia or the raindrops! I love the flower pictures but esp. the first, dripping one! 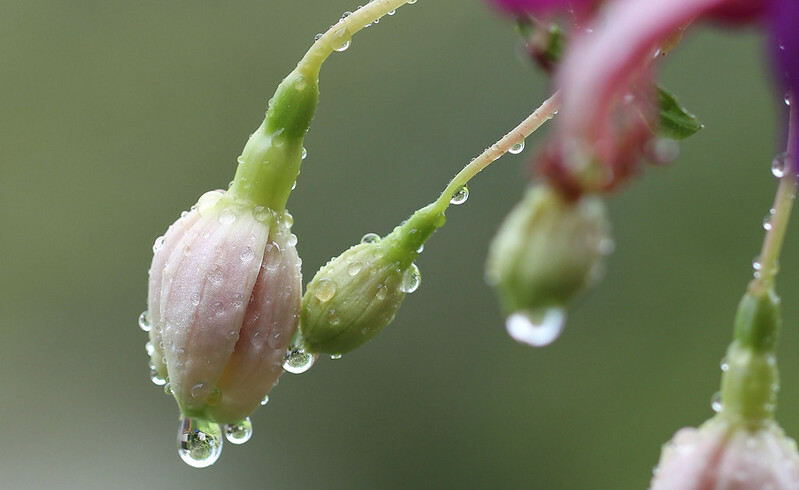 Beautiful series of photos, Hilary, with the raindrops dripping from the subjects . . . and love the quotations, especially the protection one . . . lol. My that was quite a downpour you had. And I am very honoured to receive the POTW reward. Thank you Hilary, and congratulations to the others - I will visit them. Had to swim for a chair that blew off the dock and found the water to be way deeper than I thought. Beautiful fushia...one of my favorites. The humming birds really love them, too, don't they? Congrats to your award recipients! I've read Ed's post...very clever! Wow - gorgeous rainy shots! The color in those fushias is stunning. So is the rain. A drop or two here this week but not enough to stop the dryness. Now I shall go read your reccomendations. 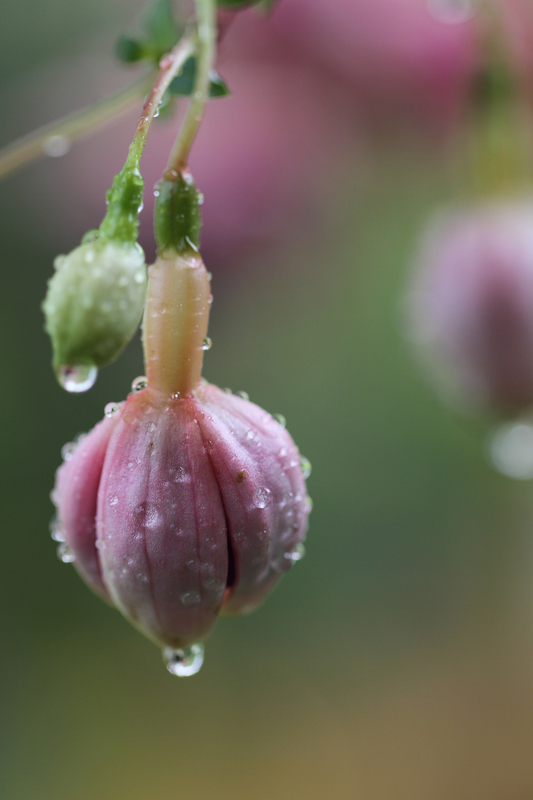 Fuchsias are always so beautiful and you captured that so wonderfully in your photos. I love the windshield wiper quote...tee hee. Love the flowers with their incredible color. Such a cheerful way to start my morning. Thanks. Hilary, these photographs are just gorgeous! Your weather looks like our weather (except I don't have a lake for my chair to blow into). 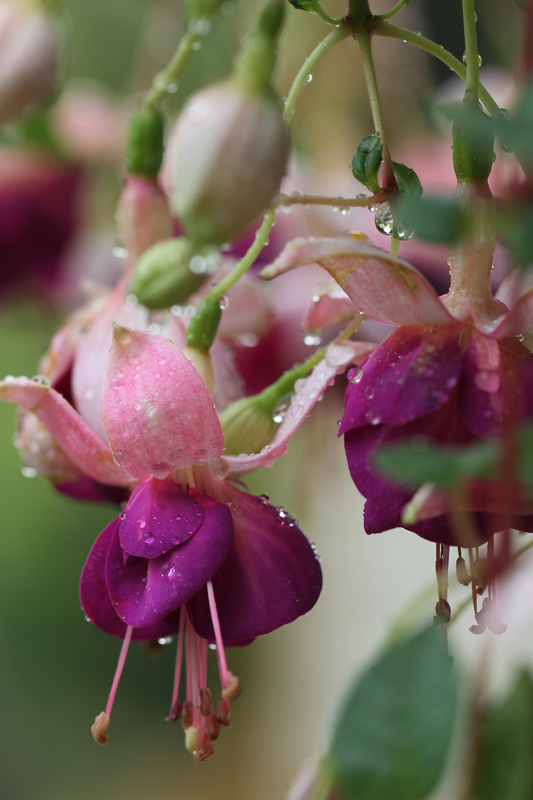 Your photos of that fresh fuchsia loveliness bring a smile to my face. You've given the blog a new look - I like! loved your photos. will have to visit potw later! Amazing colour, composition; creative use of depth of field. Another visual feast. Did you have to go and get the chair? Absolutely stunning photos! Nice done!! Those sparkly droplets are oh-so-pretty! That was some pretty hard rain, but at least the bird bath was filled with fresh water. Congrats to all the POTWers...I know some of them! These pictures are stunning. 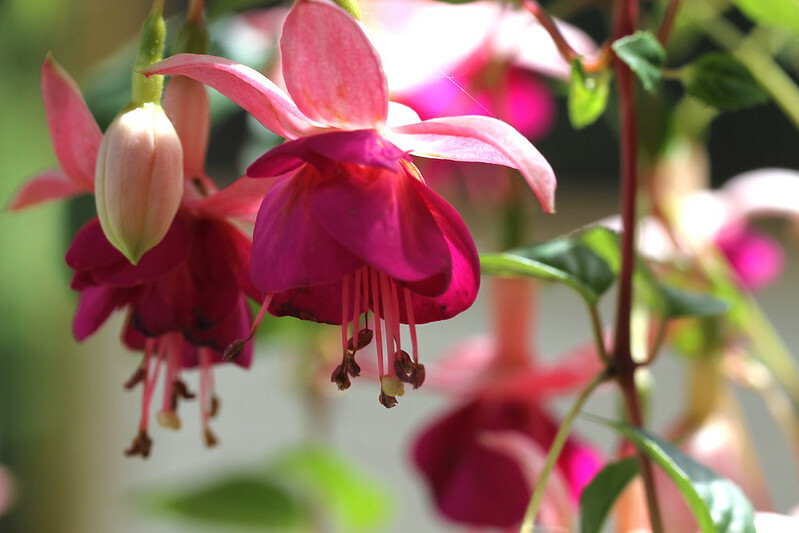 The Fuchsia looks like it is decorated with jewels. What a terrific photographic study of one potted plant. Yahoo! I appreciate the recognition Hilary. And I am trying not to attract attention here after reading your wiper quote. Oh those photos! So beautiful. Each one could be framed and hung in a gallery. Gorgeous! Goodness! That fuscia is very, very luscious, beautiful. Delicious photos! 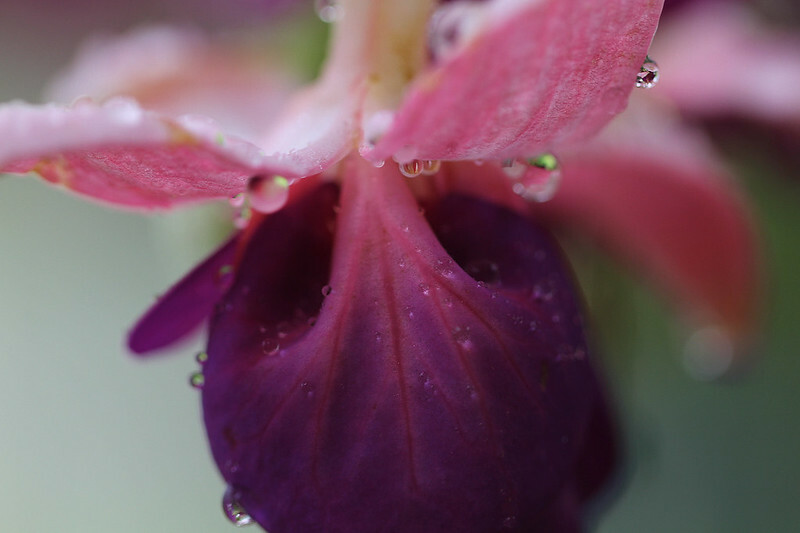 You did a masterful job of capturing the wet flowers. These remind me of when i used to love the rain. Before we lived here. Your photos are sublime and I have thoroughly enjoyed sitting here with my coffee, looking through them and reading the quotes. Bliss! WOW! Awesome captures ....that 2nd one ... it just takes my breath away!! And Daryl's POTW cracked me up! I wish to try growing one. Do not apologise for being out and about. We are grateful for your photos, quotes and blogs, when you are there. Glorious photos. I was trying for a morning dew drop and blew it! Happy you posted yours. Gorgeous photos and perfect title!! these are deliciously drenched. gorgeous captures. Glad to see life has been getting in the way of blogging - I always view that as a good thing. These photos are really excellent. You are so talented.